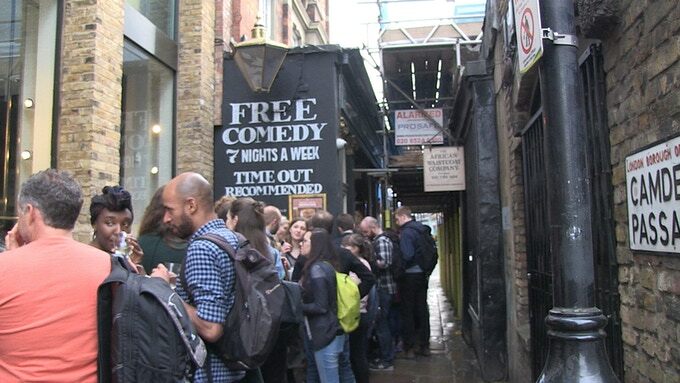 Angel Comedy has grown from a once a week gig into a seven nights a week “Comedy Institution” (according to Timeout). And we've opened our own permanent venue, the Bill Murray. We're in Islington, London, England. We have free and funny shows every single night. We support new talent and big name acts. We believe in making comedy more accessible for audiences and comedians. Angel Comedy is a London comedy club. We’ve been going since 2010, and have grown from a once a week gig into a seven nights a week “Comedy Institution” (according to Timeout). We are also people: Barry Ferns, Sarah Pearce, Rachel Warnes, Dec Munro, plus a glorious band of comedy lovers and performers, without whom we would not be here. We started out at the Camden Head in Islington, where we’re still going strong, seven nights a week. It’s one of the best loved comedy gigs in London, and consistently rated a top-ten London night out on Tripadvisor. And it’s famously FREE. Every night, always. FREE. We’re also just around the corner at our very own new venue, the Bill Murray. Here we run a more eclectic programme, as well as digging deeper into our comedy ambitions. The Bill Murray is a base for comedy courses and community projects, and a place for comedians to work, rehearse and hang out. It’s also a lovely pub. A pub? How did you manage to buy a pub? It’s a long and beautiful story. And it’s all here on our Kickstarter page. But what is Angel Comedy about? I see what you did there. Well, we’re about giving comedians and audiences a fair deal, exploring how comedy can benefit our local community, and generally immersing ourselves in funny. In our heads, that means free comedy gigs, that are well run and high quality. It also means providing a stage for the weird, the wonderful, the well established, the, er, can’t think of any other W’s, but you get the picture. We’re comedians who love comedy. We want to support other comedians on their journey. We want to make that journey viable, which means creating accessible space where artists can meet, create, rehearse and perform. Where they can learn. Where they’ll be supported. And a place where we can develop projects with schools, care homes and charities, and play an active part in the life of our neighbourhood. Well, you did ask. © Angel Comedy Club 2019 | Theme: angelcomedy by Purple Network.